A lot of us are playing our casino games on our phone or tablet these days. Online casino games really work great on today's mobile devices. This spring, during its Mobile Mania event, Slotland is giving away twelve awesome new smartphones that'll make them look their greatest! Until the end of March you can also claim a $15 freebie (if you've made a recent deposit that is). 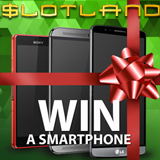 Until June Slotland will be giving away three smartphones every month. If you can correctly answer the contest questions you have a chance to win an HTC One M8 , Sony Xperia Z3 Compact, Lenovo S8 S898T+. Twelve smartphones for mobile casino games will be given away during Slotland's Mobile Mania event. This months questions and picture hints as well as full contest details are available at: http://www.slotland.eu/em/s2p/2015/0307/em.html. The first step is to claim the Mobile Mania $15 Freebie using bonus code MOBILEMAGIC. Then, email your answers to contest@slotland.eu.